If you are looking for an apartment in a quiet area to enjoy the charms of the provensal Venice, this apartment is for you! 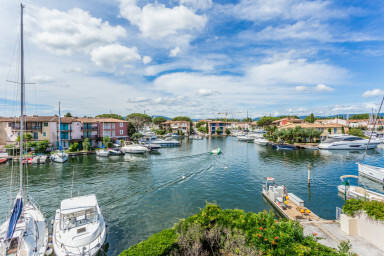 Located in a private area of Port Grimaud, it is about 5-minute away from the center and barely more from the beach. It is composed of a living-room with an open kitchen, a bedroom and a bathroom with a window. On the canal side, a wide balcony with a wonderful view with no vis-à-vis on the boats. At the bottom of the building, a 16m x 3,33m mooring and a cupboard for your boat's furnitures. An apartment that gathers the charms of nautism and the comfort of a property.